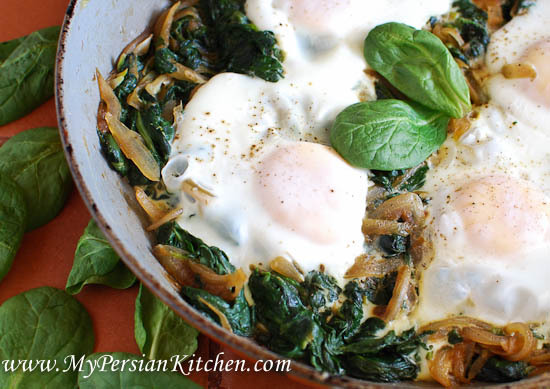 Today’s recipe is Nargesi Esfanaj which translated means Narcissus Spinach. This recipe’s name is inspired by the flower Narcissus. Specifically, the name is derived from the type of Narcissus in the above picture. 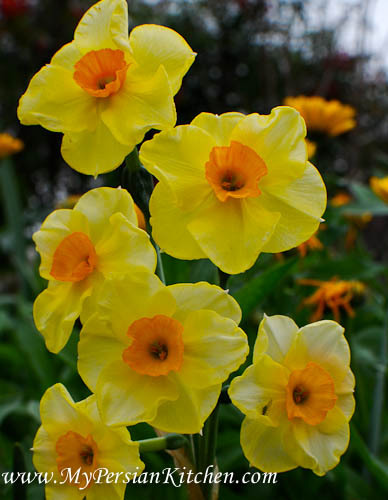 In fact, the sunny side up egg, placed on a bed of spinach and onions, looks somewhat like these beautiful flowers, which are either white or a light shade of yellow on the outside and a delicate shade of orange on the inner part. This dish is very simple both in ingredients and preparation, but flavor wise it’s incredibly delicious. 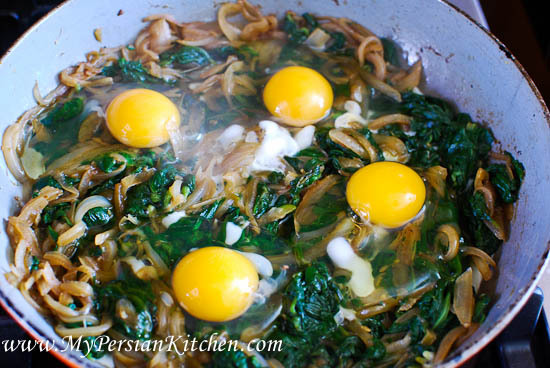 In fact, there is something really magical when the subtle flavors of the spinach and egg come together with the sweetness of fried onions. Thin slice onion. Heat oil and then add onions. Fry on medium. While onions are frying place spinach in a pot along with a cup of water. Season with salt, cover and cook until spinach is just wilted. This should take about 10 to 15 minutes. 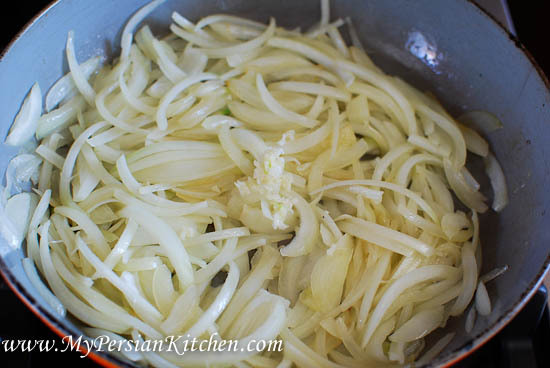 Once the onion has cooked just past translucent, add minced garlic. Continue frying until onion turns golden. 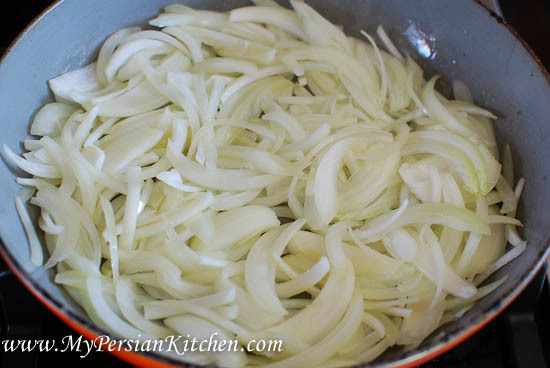 This will take a while so make sure that the onion does not burn by stirring frequently. 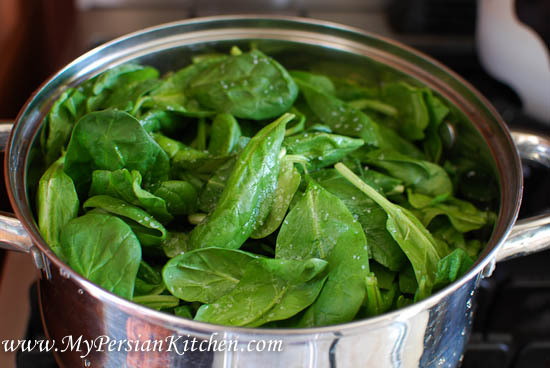 Once the spinach is cooked, drain in a colander. 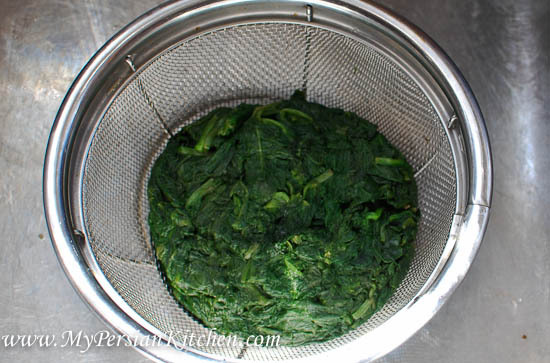 Leave the spinach in colander allowing for the juices to drain. Once the onion has turned golden, add spinach then season with salt and pepper. Continue to sauté until the spinach is heated through. 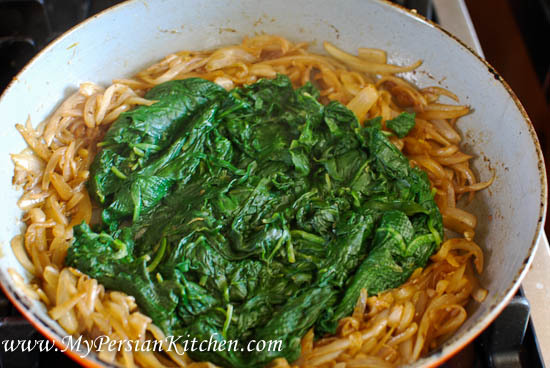 Flatten the top of the spinach and onion mixture. Carefully add eggs on top. Season eggs with salt and pepper, then cover and continue cooking for another 5 to 10 minutes until the egg whites are cooked through and the egg yolk is still runny. Such a beautiful dish from such simple ingredients! Nice recipe. A possible typo: perhaps the spinach should be cooked for seconds, not minutes. Michael, thank you for the comment. Actually, the directions are current. I absolutely love your recipes! Thank you so much for sharing them. Your website is my favorite, it’s been so helpful for me.